Casa Calvet was erected between 1898 and 1900 for the Calvets, a family of textile industrialists. It was built with offices on the ground floor, though the space now hosts a restaurant. Gaudí’s most conventional work, it received the Barcelona City Council Award in 1900 for the best building finished in that year which exhibited major artistic merits. The building was constructed by Gaudí along the strictly codified lines of houses in the Eixample district although there were problems along the way. At first Gaudí’s plans were rejected by the municipal architect of the City on the grounds that the building’s height would exceed the maximum permitted for the street on which it was to be built. However after Gaudi threatened to build it to the allowed height and then end it abruptly, the objection was dropped. The stone facade with its bay windows and sculptural decoration as well as the vestibule, stairway, and elevator reflect baroque influences. 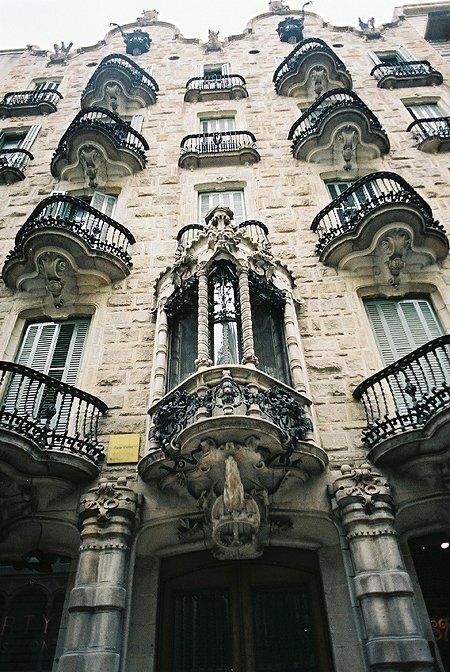 The shape of the balconies can be seen as a forerunner to shapes used at Casa Batlló where Gaudi turned much more to the inspiration of nature. The roof is topped with two pediments, each supporting a wrought iron cross, and are surrounded by various pieces of stone ornamentation as well as statues of San Ginés and Saint Peter, patron saints of the Calvet home town of Vilasar de Mar.